30. What is the best book you read this month? I had goals to read some books over the summer, and although I did manage to read some just not the ones on my goal list! 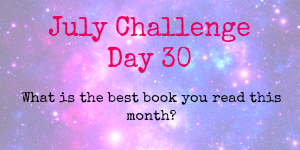 Out of what I read in June they were both pretty good Enigma then Secrets both by Aimee Ash. ← Insanity wk3 day 2 – I failed!